The roots of Afro-Cuban music can be traced to its primordial source in the West African Mandika Empire (Mali) of the 15th century. 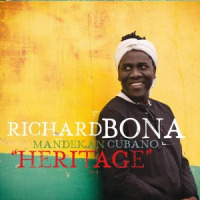 Heritage is a collaboration of Cameroonian bassist Richard Bona with the Mandekan Cubano ensemble in a musical exploration of two cultures with the common bond of Africa as a point of origin and influence. This venture revolves around familiar Cuban dance oriented, melodic structure, accented with Bona's dominant African traits, for an engaging tour de force. They begin with the Bantu incantations of "Aka Lingala Te," where the unaccompanied voices invoke the ancestral spirits. The Cuban piano montuno, provided by Osmany Paredes, shines on "Bilongo," considered an Afro-Cuban classic, it is reworked with Bona singing Douala derived lyrics. The acoustical "Matanga," translates into funeral or wake, Bona accompanying himself on guitar, it is a melancholic remembrance of a lost loved one. "Jokoh Jokoh," is arranged on the identifiable Cuban son, which endures on "Cubaneando," highlighted by the horn arrangement accenting the vocals. Africa is the inspiration of "Esse We Ya Monique," a spatial adventure where Bona's bass nuance goes back to his roots. "Santa Clara Con Montuno," is pure Cuba, where again the piano and horns play off each other in an invitation to dance by the call and response singing. The elements of mambo surfaces with "Muntula Moto," (The Benediction of a Long Life) in a fresh arrangement of a Bona original from a previous record. There is a slight shift into a more popular vein in "Eva," before returning to the Cuban danzón flavored "Kivu," featuring stunning trumpet work by Dennis Hernandez, as the blending and concocting gets more interesting. The sets closes with the African invocation "Kwa Singa," the music returning to its homeland, after a long journey around the Caribbean. 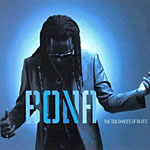 With a slew of albums out since his debut in 1999, and a fixture on global stages, Bona continues to evolve his unique craft of storytelling enhanced by his virtuosity on bass. This foray into Afro-Cuban music expands upon his repertoire and reputation of defying genre categorization, and exhibits what a perfect collaboration should sound like. Track Listing: Aka Lingala Te; Bilongo; Matanga; Jokoh Jokoh; Cubaneando; esse we Ya Monique; Santa Clara Con Montuno; Ngul Mekon; Muntula Moto; Eva; Kivo; Kwa Singa. Personnel: Richard Bona: bass, guitars, electric sitar, vocals, percussion, keyboards; Osmany Paredes: piano; Luisito Quintero: percussion; rey Alejandre: trombone; Dennis Hernandez: trumpet; Roberto Quintero: percussion.